Products and technology are only valuable when coupled with skilled people and services to support them. ORIENTAL MOTOR U.S.A. CORP. has dedicated over 33 years to establishing a service and support system to better serve customers. It is our goal to provide the best product and service from the design phase, through the sale and beyond. In the world of industrial robotics, there are several types of robots typically offering multiple axes of motion for tasks such as parts assembly, material handling, or pick and place operations. These include articulated robots, cartesian/gantry robots, SCARA robots, and Delta robots. Variations of end effectors such as grippers, welders or part rotators can be mounted on the end of the arm to perform different tasks. Depending on number of axes or load capacity, costs can easily add up. 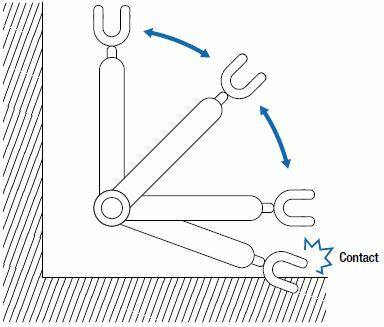 Limiting the operation range for these robotic axes of motion is an easy way to prevent costly problems or safety issues later. 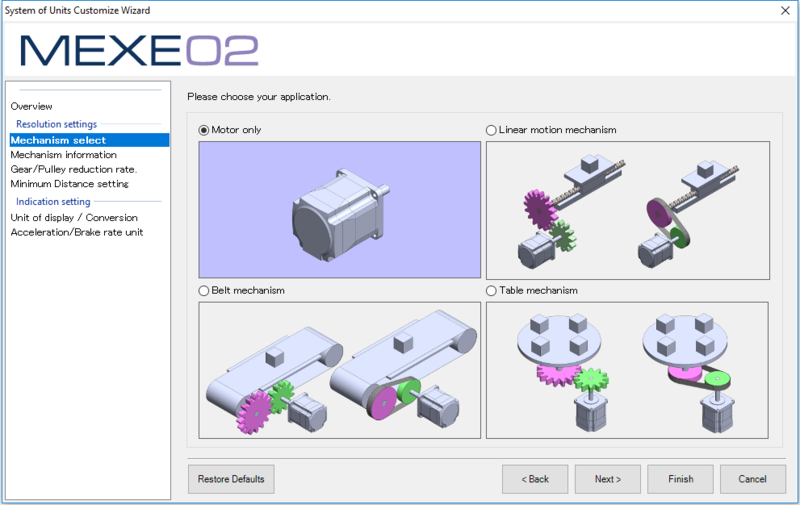 The MEXE02 support software is a universal motion control and monitor software used with multiple stored data type products from Oriental Motor, such as the stepper motor drivers from AZ Series, AR Series, and RK2 Series, or brushless DC motor drivers from BLE2 Series and BX2 Series. This post is useful for first-time users to gain a quick understanding of the software and what it can do. A driver is a must-have for any stepper motor. In a stepper motor system, a driver controls how the motor operates based on signals received from the controller. It is responsible for sending current through various phases in a stepper motor and also regulates the motor current (torque) and step resolution. With recent trends of minimizing machine footprint, finding space to install drivers could be challenging. With recent trends focusing on improving engineering efficiency, many products have been developed to specifically help shorten design cycles for machine automation. Part of improving efficiency is making products easier to use, so additional time and resources can be spent elsewhere. This post describes an example of a product feature that can make index table applications less complex to manage. There are many stepper motor manufacturers in the market place, but there are even more driver manufacturers. The crowded market place provides many standard product options for customers to build their motion control system just the way they like it. However, if the best possible performance is desired, it would be difficult to beat a tested combination of a specific motor and driver from the same manufacturer. 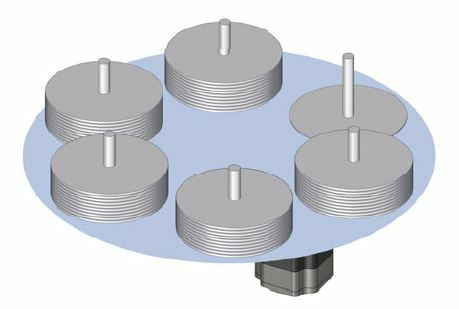 By combining R&D knowledge from both motors and drivers, unique product features can be developed to improve the performance further. 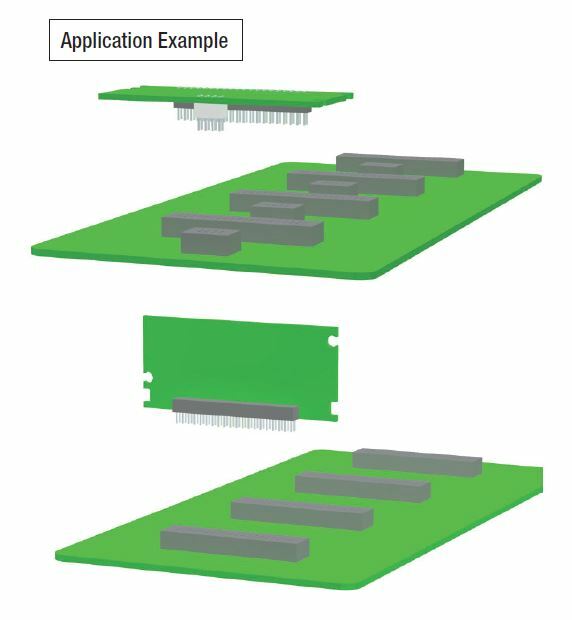 In this post, we will discuss 3 main advantages of using a CVD driver with a PKP Series stepper motor. There's also a video at the bottom of this post that summarizes the features. Stepper motors are popular for their ability to position accurately as well as their ease of use. Both the amount of rotation and the speed are controlled easily with the same digital square wave pulse signal. Unlike servo motors, stepper motors do not need an encoder to operate. Example applications of stepper motors are CNC machines, index tables, robotics, scanners, and more recently, 3D printers. Oriental Motor offers an extensive product line-up of about 50,000 different products that provide the optimal motion system. For over a century we have concentrated on technological advancement and product design improvement. This emphasis is evident in the sophisticated devices that we market today. Oriental Motor's sales and service network is international, with offices throughout North America, Europe and Asia.